American news organizations have long been criticized for failing to anticipate, appreciate and exploit the Internet as it became a fact of daily life in the mid-1990s. 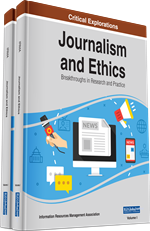 This chapter explores and analyzes the lack of planning that stymied the development of journalism on the Web and cast doubt on the viability of traditional public-service journalism with its enduring values of accuracy, fairness and advocacy. Specifically, the essay documents and analyzes the online debuts of two venerable “old media” news outlets (The New York Times and The Los Angeles Times) and two “new media” Web news outlets (Salon and Slate) in the mid-1990s by exploring the claims they made about their aims, purposes and expectations as they introduced themselves to the public via their salutatory editorials. It is a cautionary tale for a digital world that reconfigures itself in ever-quickening cycles. The Internet became a fact of everyday life in the mid-to-late 1990s (Manjoo, 2009). By 1996, about 13% of Americans were online, and spent about 30 minutes per day surfing the Web; by 2000, the number of Internet users had more than tripled and penetration had reached 44%. By 2014, penetration reached 87% (Internet World Stats, 2014). The Internet’s impact on traditional news media outlets was quickly, and painfully, felt in the mid-to-late 1990s. Many newspapers and magazines created online versions without giving careful thought to aesthetics, function, audience or – most disastrously – revenue. Some stepped into the digital realm assuming that familiar and predictable models of economic support would manifest naturally. Others took a build-it-and-they-will-come approach. Meanwhile, Internet service providers, Web portals and aggregators, such as AOL, Netscape, Yahoo and (eventually) Google, presented users with a Whitman’s Sampler of news, information, entertainment and trivia from a wide and rapidly expanding array of sources and services that undercut every facet and feature of the traditional news business – information, speed, and display and classified advertising. Aggregating gave regional or specialized publications entrée to new audiences, but reduced all members of the aggregate – including the flagships of American journalism – to the status of supporting players in an epic ISP-directed narrative of the day’s events. “Old media,” i.e. traditional newspapers and magazines, continued to conceive of and market themselves as destinations designed for specific kinds of visitors (people interested in journalism and advertising), but Web portals functioned like airports, serving as points of departure to an almost infinite number of destinations. Thus, just about any kind of advertiser could be confident that his or her message would find interested parties at Web portals. Between 1999 and 2009, as advertising revenues at newspapers slumped, annual online advertising revenues increased from just under $5 billion to nearly $25 billion (Kirchhoff, 2011). Newspapers stumbled onto the Web with crude avatars of their print products. It was as if in the 1930s, as highways expanded, the Pennsylvania Railroad rushed into production a steam-powered, cast-iron automobile that looked just like a locomotive. Meanwhile, “new media” enterprises, such as Microsoft-sponsored Slate, reached into the world of tradition and cast celebrity cable journalist Michael Kinsley in the role of digital shaman whose reputation in the world of print and broadcasting would serve as a foundation for a new, Web-based journalism. Whether tethered to established newspapers or magazines, or created out of thin air, Web products that promised the “feel,” credibility, ethos and style of traditional professional journalism by and large did not capture the public’s attention, or at least not enough of its attention to compel it to seek out and pay for online news, information, commentary and entertainment from established newspapers. It’s also possible their indifference had deeper roots – i.e., they hadn’t been terribly interested in the old media products they’d been buying for years but simply acting out of habit or lack of choice – until they were offered new options via the web (Barnhurst & Nerone, 2001). American news organizations have long been criticized for a lack of planning, for not more effectively anticipating, appreciating and exploiting the Internet. Journalists such as ProPublica Editor Richard Tofel (2012) assert that this lack of planning stymied the development of online journalism and cast doubt on the viability of enduring journalistic values such as accuracy, fairness and advocacy. The diminishment of these values, in turn, endangered democracy itself (Jones, 2009).